When it comes to fencing, there are a number of choices: wood, wrought iron, wire, chain-link, iron, and vinyl. Within those types of materials, there are many more varieties, and, plenty of differences in function and/or aesthetics. A fence can be used for containing, or, simply for looks. Many homeowners like the look of wrought iron because it’s classic, as well as simple and stylish. Wrought iron can be found around historic parks and public buildings, museums, and residential homes precisely because of its qualities. This type of fencing offers extraordinary durability, but, it must be properly care for over its lifetime. Unlike other types of fencing, wrought iron is manufactured with heavy welds, so, it’s chosen not only for its beauty, but its strength. What’s more, it comes in a variety of styles and heights, and, is ideal for creating a barrier that you can still see through. 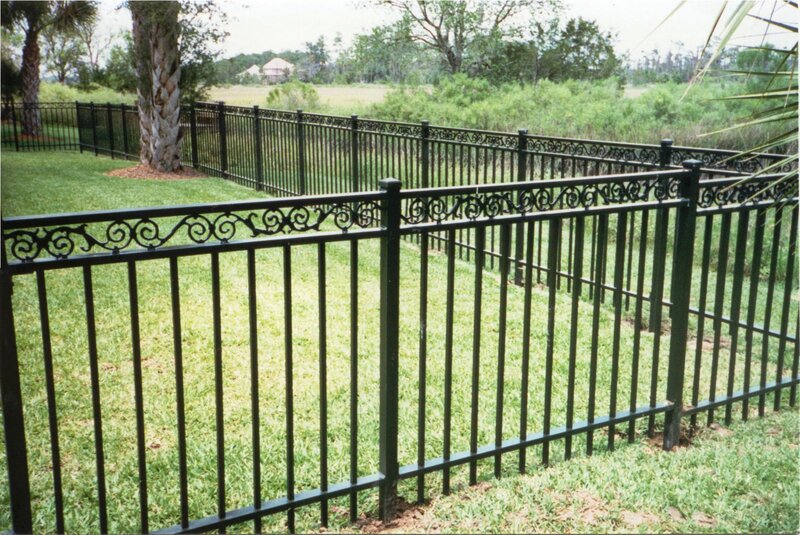 Wrought iron can be installed into the ground or even on top of concrete. If installed the right way, wrought iron can also be installed on hilly ground, slopes, or in cut-sections. As mentioned, wrought iron is very durable, built to last a lifetime, allows you to see through it, and, has an elegant look. However, wrought iron isn’t at-all ideal for privacy. If you need a fence for privacy, then wood and vinyl are good choices. Both wood and vinyl provide privacy while clearly marking boundaries. If you are set-on wrought iron fencing, you might not know that it comes in different styles, and, that it can be sold unpainted or painted. The great thing about a wrought iron fence is that it provides a very strong perimeter for any residential yard, or, along a large, unimproved space. Homeowners enjoy its ability to keep kids and family pets close to home, while simultaneously keeping neighborhood dogs and strays off their properties. Wrought iron is considered to be medium security, though, a 6-foot fence will provide more security than a 4-foot fence. Before you start the installation process, be sure to check local fence codes and have utilities clearly marked, unless you have an to tear down an existing fence. You should also measure the area at least twice to ensure you purchase the right amount of fence materials. In addition, take some time to clear fence path of any obstructions. Once you’ve done these things, then, you’ll need the following tools: a post hole digger, spade shovel, level, hack saw, tape measure, drill-driver, hammer, string line, wheelbarrow, concrete mix, ground stakes, and gravel. Mark the installation line. Hammer stakes into the ground along the installation line. Then, stretch string line along each stake to have a clear installation line to follow as you put the wrought iron fence up. Make sure that the line is still within your property line at this juncture, before you begin the actual installation. Dig holes for the posts. Using a post hole digger, excavate the support post holes along the installation line. Each hole should be at least 6 inches in diameter and 2 feet deep. It’s best, though, to increase this to about 8 inches in diameter and 3 feet deep. This will provide more support strength. Mix the concrete and set the posts. Mix the concrete in a wheelbarrow, following the manufacturer’s instructions. Be careful when mixing the concrete because if it’s too watery, it won’t cure correctly, and too little water will also be a bad result. Right after the concrete is mixed together, place the support posts into the holes, one-by-one. Then, pour in the concrete mix. Let it dry for as long as recommended by the manufacturer. Fasten the fence sections to the posts. After two or three days, it’s time to fasten the sections to the posts. Use a drill-driver and screws to fasten the fence sections to the posts, one at a time. As you go, be sure the railings are lining-up to make it look right. Hang the gate and attach the latch. Once all the fence sections are fastened to the posts, you’ll only have one part left — the gate. In most instances, it’s advisable to wait a few or more days to hang the gate, if applicable. When you do hang the gate, be sure to check it for levelness so it doesn’t swing in one or the other direction when unlocked. After your wrought iron fence is fully installed, you can then plant flowers around it, or, another type of softscaping.